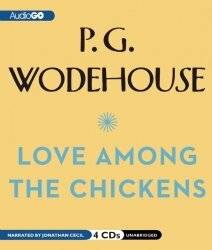 Listening to Jonathan Cecil read P. G. Wodehouse is getting to be my standard entertainment when driving. I will be devastated when I run out of library audiobooks. As it is, this was my first book, not about Jeeves and Wooster, but about Stanley Featherstonehaugh Ukridge and his friend, the narrator, Jeremy Garnet. The book starts when newly married Ukridge talks Jeremy, a novelist, into joining him in the countryside as he starts a chicken farm. Ukridge is sure chicken farming is the road to riches, so he feels free to buy all their supplies on credit. As Jeremy travels to the farm, he sees a young lady on the train whom he will never forget. Well, the road to true love does not run smoothly. The young lady, Phyllis, and her father do end up being neighbors, but when they come to dinner at the farm, Ukridge manages to alienate the father, which he holds against Garnet as well. When Garnet hatches a plan to restore himself to good favor, it works for awhile, all the more disastrously to fail in the end. And meanwhile, Ukridge’s adventures in chicken farming are nothing if not entertaining. Even without Jeeves and Wooster, this is a typical Wodehousian farce, with larger-than-life characters and tangled schemes, which generally work out in precisely the worst way, but also the funniest way.